Ever since I made my first frittata a few months ago, I have been obsessed by them. And with good reason, I think. They are easy to make, you can put just about anything in them, they can be eaten hot or cold, so leftovers are not a problem. In fact, I have gotten in the habit of making one early in the week so I can have a quick breakfast I can grab and take to work with me on those mornings when I don't feel like making something before I leave, or I don't have time. I like mine on the thick side, so it can be difficult to cook it long enough for it to set without burning the bottom, but I have learned a few things. I cook it low and slow, and periodically lift up the edges and let some of the raw egg spill over to the bottom of the pan. 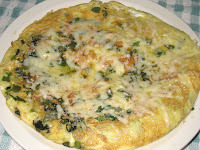 I do that a few times until there is just a little big of egg still unset on top, and then I flip it and cook the top. I am happy with the recipe I used from James Beard's American Cookery and posted about here. 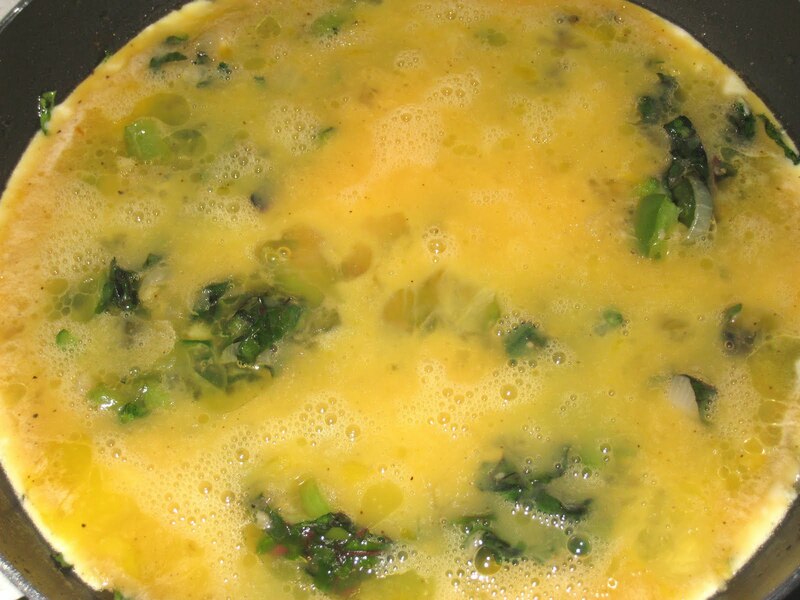 I have made some adjustments since then, mainly to accommodate the thickness of the frittata and the size of my pan, which is a little too small to hold the 8 eggs called for in the recipe. At some point, I need to get a bigger pan, but in the meantime I have adjusted the recipe and am coping just fine. I will say this, though: when I do get a new pan, it will be oven-proof. While the James Beard recipe is a good one, I thought it might be helpful if I provided a little how-to for anyone who might be a little nervous about trying this for the first time. I won't repeat the recipe now - you can find at my original post. If you haven't made one yet, I highly recommend you try it. It's also perfect for weekend brunch. The first thing to do is heat a combination of oil and butter in a medium-sized skillet. The original recipe calls for olive oil, but I have found that a combination of grapeseed oil and butter gives me the best flavor profile. You can use whatever works for you, but you do need to use a fair amount, at least 3 tablespoons. If not, you run the risk of the egg sticking to the pan, even if you use a non-stick pan. Once the oil is hot enough, lower the heat and add the onion and the garlic and cook until it just starts to turn translucent. 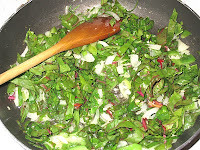 Add whatever vegetable you are using, season with salt and pepper, and let it cook until it has softened. How long you let it cook at this point depends on what you are adding. When I am adding thinly-sliced potato (which I have started doing with much success), it can take a little while to soften. If you are using more than one vegetable, start with the longer-cooking one, then add the faster cooking ones a few minutes later. Here I added Swiss Chard, which takes only a few minutes to cook. Keep the heat low for this process. You want the vegetables to cook, but you don't want them to caramelize. Low and slow is the way to go in this case. A few minutes before the vegetables are ready, crack the eggs into a medium-size bowl. 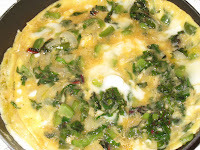 Add salt and pepper (and any herbs/flavoring you want to use - I have found tarragon, or oregano, or even a teaspoon of Worcestershire sauce to work quite well) and whisk together until the eggs are well mixed. 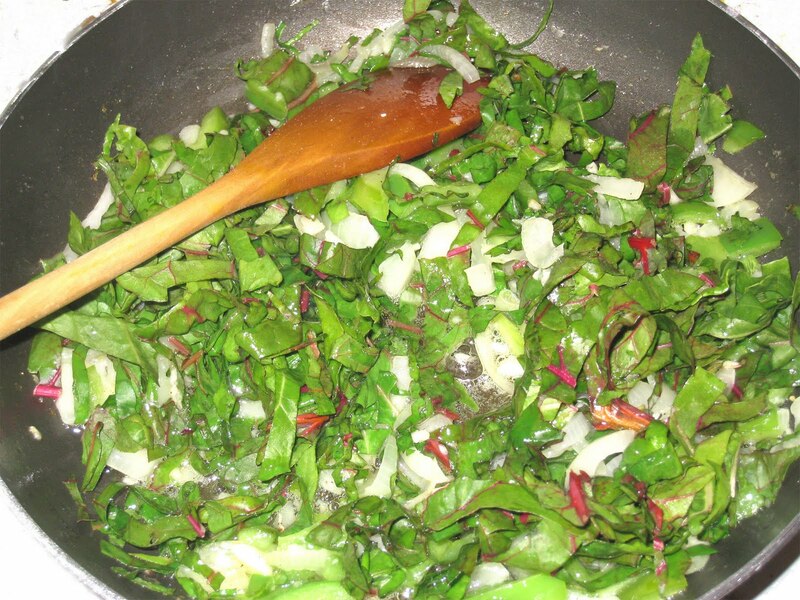 Spread the vegetables evenly around the pan. Slowly pour the egg mixture over the vegetables. Make sure the heat is low. I have been hearing a lot lately about how important the sounds of cooking are to the success of a dish. That is true here. You want to monitor the heat to make sure your eggs aren't setting too quickly on the bottom of the pan. If you can hear them cooking, then the heat is too high. Once the eggs have set around the edges, take a spatula (silicon is best) and work it around the edges to loosen them and make sure they are set enough to hold. When they are set enough, lift up one section and tilt the pan so that the raw egg mixture pours over the edge to the bottom of the pan. Gently set the lifted part back down into the raw egg. Wait a few minutes, until the raw egg has had a chance to set, and then lift a different section and pour more raw egg over the edge to the bottom of the pan. Do this a few more times, until there is just a little bit of raw egg left on the top. There should not be enough raw egg to spill off of the frittata when you transfer it to a plate, if that is the method you are going to use. 1. If your pan is not oven proof, you can take the pan off of the heat and, using the spatula, gently transfer it onto a plate. Then take the skillet and lay it over the frittata and turn the whole thing over so that the top of the frittata is upside down in the pan. Cover it with the grated cheese, then cover the pan and let it cook for another five minutes, long enough for the bottom to set and the cheese on top to melt. 2. If you have an oven-proof pan it is much simpler. You simply cover the top (there will still be raw egg there) with the grated cheese and pop it under the broiler for a few minutes so the top sets and the cheese melts. Both methods are successful, with slight differences. The main difference is that the cheese will not brown on the stove top the way it will in the broiler. A word about the cheese. The recipe calls for Parmesan cheese, but I have successfully used whatever cheese I have in the refrigerator, including cheddar and mozzarella. Any cheese that melts will work here. My non-stick skillet is not oven proof, alas, and the eggs stick to my cast-iron skillet, so I most often use the first method. But sometimes I will take the frittata and transfer it to my cast iron pan instead of a plate, and then finish it off under the broiler. Whatever method you use, the end result is delicious. For leftovers, I just take it out of the refrigerator and let it sit for about half an hour while I go about my business. Once it's at room temperature, I eat it as is. 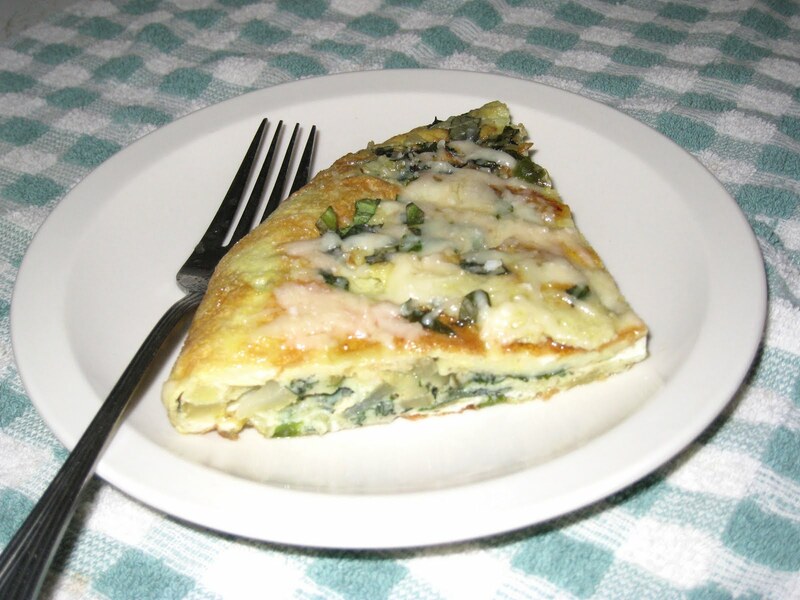 A quick, easy, delicious breakfast, and one of the most versatile, considering the limitless ingredient possibilities.